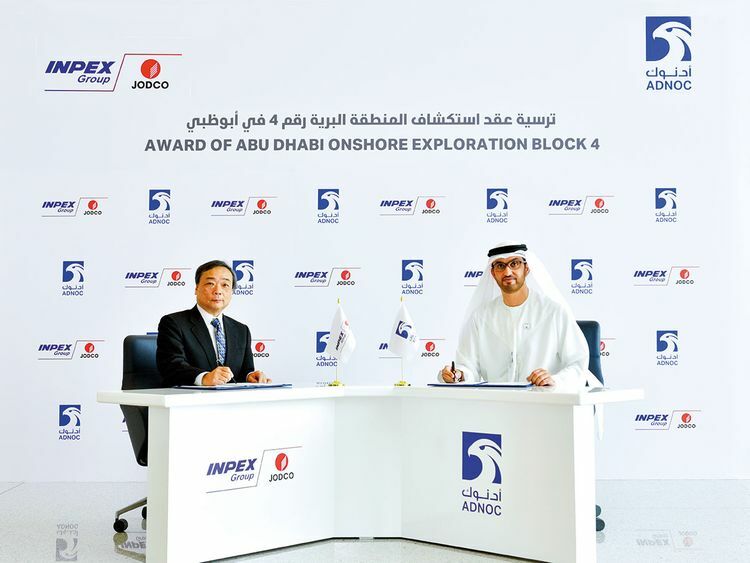 Abu Dhabi: Abu Dhabi National Oil Company (Adnoc) on Sunday signed an agreement awarding the exploration rights for Abu Dhabi Onshore Block 4 to Japan’s Inpex Corporation. The awarding of the concession comes as Abu Dhabi targets 5 million barrels per day of oil production by 2030 from the current levels of about 3 million barrels per day. As part of the deal, Jodco Exploration Limited, a wholly-owned subsidiary of Inpex, will hold and manage the interest in the concession on behalf of Inpex. The agreement has a term of 35 years. “For over 40 years, Inpex, along with its subsidiary Jodco, has been a strategic partner to Abu Dhabi and Adnoc. Today’s agreement, following a competitive bid round, extends that long-standing partnership between one of the world’s leading oil and gas resource holding countries and the third largest global economy, and represents an attractive and strategic opportunity for both parties that will deliver mutual benefits,” said Dr Sultan Ahmad Al Jaber, UAE Minister of State and Adnoc Group CEO, in a statement. Inpex will hold a 100 per cent stake in the exploration phase, investing up to Dh646 million ($176 million), including a participation fee, to explore and appraise oil and gas opportunities in the block that covers an onshore area of 6,116 square kilometres from Abu Dhabi city to the boundary with the Emirate of Dubai. Inpex will also have the opportunity to develop and produce any commercial discoveries after exploration activities with Adnoc having the option to hold a 60 per cent stake in the production phase of the concession. Onshore Block 4 is the latest block awarded to an international bidder of the geographical areas that were offered for commercial bidding by Adnoc in April 2018 following the recent award of Offshore Block 1, Offshore Block 2 and Onshore Block 3 Concessions. Abu Dhabi’s exploration blocks are expected to hold multiple billion barrels of oil and multiple trillion cubic feet of natural gas. “This agreement to explore and appraise oil and gas opportunities in a highly promising sector of Abu Dhabi underpins the importance of our ongoing partnership and the further strengthening of a decades-old and progressive business relationship between Inpex and Adnoc,” said Takayuki Ueda, President and CEO of Inpex Corporation. Inpex through its subsidiary Jodco has a long association with Abu Dhabi starting operations in 1973 with its participation in the Umm Shaif and the Lower Zakum fields. Jodco then joined in the development of three other offshore oil fields, the Upper Zakum field in 1977, Umm Al Dalkh in 1978 and Satah in 1980. In 2015, Inpex was awarded a 5 per cent stake in the Abu Dhabi Onshore Concession. In 2018, the Japanese firm was also awarded a 10 per cent stake in the new Lower Zakum offshore concession and, at the same time, also extended its 40 per ent stake in Satah and increased its stake in Umm Al Dalkh from 12 per cent to 40 per cent. The UAE provides Japan with 25 per cent of its crude oil imports.